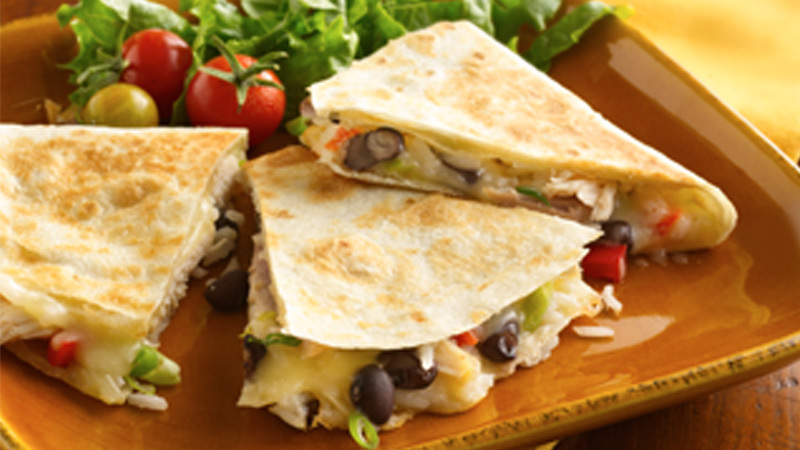 Quesadillas make a meaty main dish with cooked chicken, black beans and rice. 1. In a medium bowl, mix chicken, pepper, spring onions, beans and rice. Top half of a tortilla with some chicken mixture and some of the cheese. Repeat with remaining tortillas dividing chicken mixture and cheese evenly between the 8 tortillas. Fold each tortilla over filling, press down slightly. Mist each of the top halves of the tortillas with the cooking spray or lightly brush with oil. 2. Heat 30 cm non-stick frying pan over medium-low heat. Place 2 filled tortillas at a time, sprayed sides down, into the pan. Cook 4 to 5 minutes, turning once, until golden brown and hot. Repeat with remaining tortillas. Cut into wedges and serve with salsa and sour cream. A shredded lettuce salad tossed with slices of ripe olives, avocado and tomatoes makes a nice accompaniment to these quesadillas.